...we found George. Not 'a' George. The George. 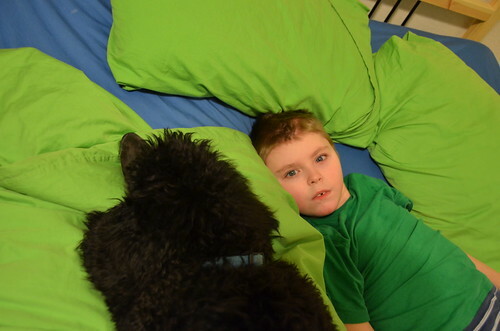 Granted there has been some excitement and enthusiasm the last few days as we've raised money to get Max's service dog. However, I am blown away by this dog. George has been with us just over 24 hours and he already feels like we've known him forever. There is a knowing when you look in his eyes that I have only seen in seasoned, mature animals. I told Deana today "he is an old soul." He is incredibly bright, anticipating actions before the happen, responding to the slightest correction and direction. He is alert and responsive to Max, finding him wherever he is in the house to be near him. And yet he is still loving and attentive to everybody. I continually have to remind myself "HE IS ONLY FOUR MONTHS OLD." 1. It started this morning when George went to find Max before Max was awake. He crawled up in bed beside him and slept until Max woke up. 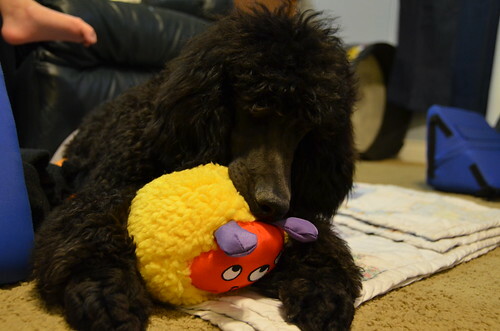 It proceeded throughout the day as George would find Max, wherever he was in the house to be by him, near him, on him. Everytime I went to change a diaper, George would get up from where he was to come check on Max. 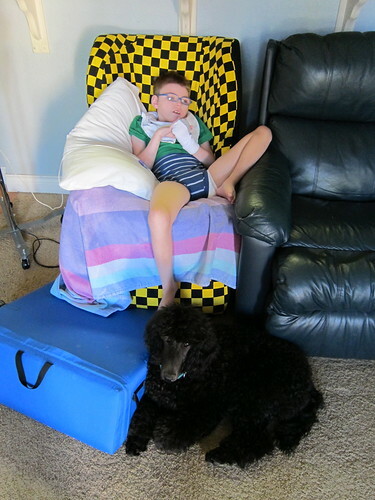 He would stand on his hind legs, front paws on Max's chair making sure Max was okay. This is behavior that typically has to be trained for years before a service dog is ready for this. In 24 hours, he latched onto his person with little more than an introduction and giving him the space to do his job. 2. 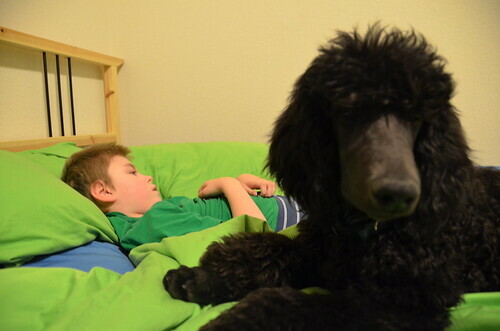 At the end of music therapy, Max was feeling upset. George was laying beside Max by his own choice. George's front legs were out in front of him with Max's leg across George's legs. 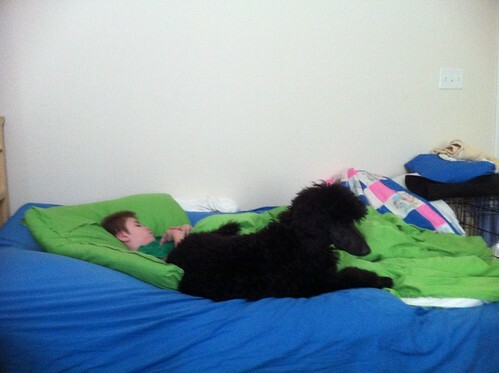 As Max was crying and fussing, George laid his head down over Max's leg to soothe Max and help him calm down. Notice Max's mouth in the photo above as he's just been crying before George helped him calm down. 3. For those of you who have seen Max, you know how strong and out-of-control his legs can be. 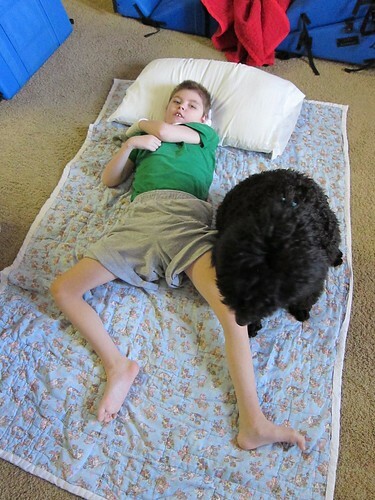 Max's leg movement is often described as spastic. A non-medical description would be lots of movement, often very forceful, with limited control. I have had knock me down with his kicks. Even with weekly physical therapy for 7 years, he still has limited control. Today I watched Max gently, cautiously reach out with legs that are typically out-of-control to gently feel George. He would carefully run his toes through George's coat. He would reach from his chair with the tips of his toes to see if George was nearby. 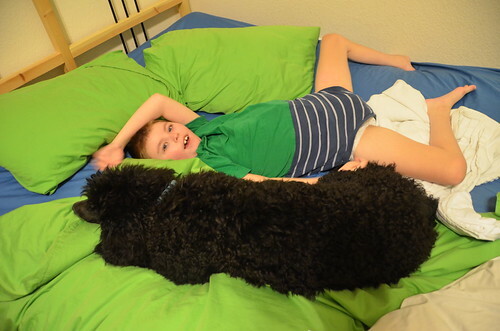 SEVEN YEARS to help him gain gentle control in his legs and George is already influencing him after 24 hours. I couldn't make this stuff up if I wanted to. Two friends were by the house today (family friend and music therapist) and they could not believe how calm and attentive George was to Max. THIS DOG IS FOUR MONTHS OLD! If there were any doubt whether this was Max's George, it is gone. There is not logic to explain the connection that exists between these two already. Perhaps these two are both old souls who have known and been looking for each other from times past. Can you imagine what they are going to do together this time around? We are grateful, thankful, and mesmerized by how perfect of a fit George is so far. Bedtime. These are not posed photos. George did this himself. 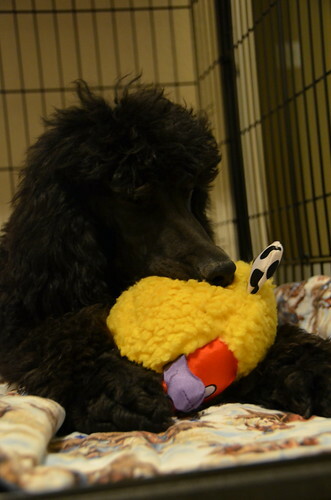 George with his new toy, at the end of a long first day of work. Oh yes...he is asleep like that. I know Deana before, has written about how exciting it is for Max to be in schooling, how normal that part of life is for a seven year old. Now...Max is a boy with his dog. I think that bond is a special one, no matter what obstacles are present. That George truly IS a service dog, not just through training, is a miracle. So typically poodle behaviour, I am typing this with Roxy spralled across the floor with her head on my feet. Love the bond they are building. So happy! George sounds heaven sent! I just loved reading about Max's gentle touch with his legs and feet, awesome!! !